More great freebies. Steven Baxter (One of the best living SF writers) has an audio story at Clarkesworld. There's a new reading of Ray Bradbury's unforgettable "The Veldt" at Selected Shorts (Hosted by Neil Gaiman, with the second story read by Leonard Nimoy). There's more greatness by Kristine Kathryn Rusch, Mur Lafferty, etc. Be sure to check back here regularly and to visit SF Signal for more free fiction. [Art from "The Thrill of the Hunt" in audio fiction. • At Buzzy Mag: "Unremembered, Unforgotten" by Ken Altabef. Urban Fantasy. "Flakes of red crumbled away from her fingertips as Dolorza brushed absently at the mark. None found in the home, she thought, but three victims all the same. Her father, who had succumbed to lymphoma seven years after the exposure, her mother, who had died of a broken heart soon thereafter, and the silent price she herself had paid over the years." • At The Silver Blade: "The Greatest Shade – Part 2" by Bryan Wein. Fantasy. "The next morning Dressen smacked his hand against the water sensor three times before the shower finally gurgled to life. A few seconds later the fluorescent tube overhead came on as well, thanks to some problem with the circuitry. Dressen cursed and dimmed the light with blind, groping fingers." - part one here. "A travel writer takes a job with a shady publishing company in New York, only to find that she must write a guide to the city - for the undead!" • At Clarkesworld: "Cilia-of-Gold" by Stephen Baxter. Science Fiction. "She climbed up through the water, her flukes pulsing, and prepared to lead the group further along the Ice-tunnel to the new Chimney cavern"
• At Decoder Ring Theater: "Red Panda Adventures (97) - The Phantom" Noir. Superhero. Humor. "As the tides of war begin to shift in favor of the Allies, all is far from quiet on the Home Front. A new boss of bosses has taken control of the city and declared war upon the Red Panda and his allies!" • At Selected Shorts: "Dreams and Schemes" Science Fiction. "Guest host Neil Gaiman introduces two American classics. In Ray Bradbury’s futuristic “The Veldt,” a virtual reality nursery turns on its owners. The reader is Stephen Colbert. In James Thurber’s “The Catbird Seat,” a mild-mannered employee plots revenge. 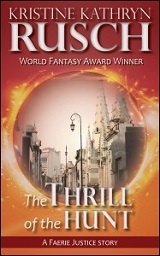 read by Leonard Nimoy"
• At WMG Publishing: "The Thrill of the Hunt" by Kristine Kathryn Rusch. Paranormal. "Her family called her Hilda, before the war, before the Great Wulf murdered them all with his mind. Now the war is over, Europe is in ruin, and the remaining Nazis have scattered. Hilda hunts them, but really, she hunts him. And thanks to an old friend, she has tracked him to Argentina. She’s supposed to kill him, but she’s not sure if she can. She won’t know until they’re face to face, until it’s time for one of them to die." The Guardian of Threshold - A Young Adult Paranormal Fantasy by A.A. Volts. Titan Lost (Galactic Lineage) by Colin Kortekaas. Science Fiction. The Adventures of Redman Red by Nick Hall and Nathaniel Haynes. This Machine Kills by Steve Liszka. Dystopian. Novum by Joseph Rhea. Post-Apocalyptic. The Circling Song by Russell Cruse. The Chronokey: Death's End by Carmel Morris. Fantasy. Paranormal. Una'ria The Vanguard Echoes by Daniel Cruz. Science Fiction. Defenders of Rades by Carol Blackhurst. Science Fiction. Tyme and Yon Serpent (Serpent's Tail) by MJ Holmes. Fantasy. With Dragons She Walks by Brit Darby, Fela Dawson Scott, Patricia McAllister. Fantasy. On the Back of the Beast by S F Chapman. Apocalyptic. Black As Night (The Augmentamancer Chronicles) by Daniel Mckay. Paranormal. Venus Rising (Linda Kay Daniels Adventures) by Rowena Tulley. YA Science Fiction. Adela Arthur and the Creator's Clock (The Chronicles of A) by Judyann McCole. YA Fantasy. The Grave Artist by Paula Lynn Johnson. YA Paranormal. Winged Descent (The Winged Trilogy) by Heather Allen Dencker. Paranormal Romance. Solar War by Kevin Griffis. Military Science Fiction. Caleo (Leech) by James Crawford. YA Paranormal. Spell/Sword by G. Adams. Fantasy. • At WMG Publishing: "Name Calling" by Kristine Grayson (Kristine Kathryn Rusch). Romance.